Publisher : Archie Comics Publications, Inc.
Is Archie Comics for Sale? 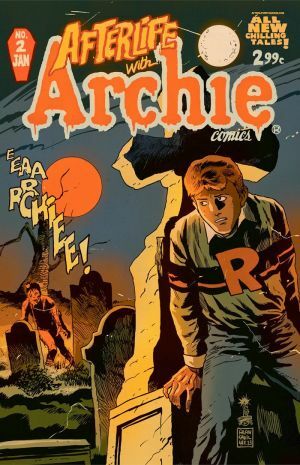 There have been plenty of interesting, if not groundbreaking, Archie Comics stories over the past few years, but when Afterlife With Archie was announced, I'm sure I'm not the only one who rolled my eyes. Marvel Comics did it. DC Comics sort of did it, and now Archie Comics was going all the way. The zombie-craze was finally going to be exploited by the the company that brings you Archie Comics, and the tales of the lovable Riverdale Gang. Only I didn't expect to as pleasantly entertained, as I was exploited, after reading Afterlife With Archie #1. There's nothing particularly groundbreaking about Afterlife With Archie, but it is so well done that it will most likely take its place amongst the classics of pop sequential art books. Dark, moody, and devoid of bright colors (even Pop Tate's diner is drenched in Halloween orange and blacks), and boasting the art of one of the best sequential artists in the business right now, Francesco Francavilla, Afterlife With Archie is not only a great Halloween read (the events of the first two issues take place on Halloween evening), it's a great horror read in general. Writer Robewrto Aguirre-Sacasa manages to do what the writers of the most successful and currently popular zombie tales do: focus on the characters rather than the non stop action and gore. There's plenty of that in Afterlife With Archie, but the stories and depth of character that Aguirre-Sacasa brings to our old favorites is a breath of fresh air amongst the rotting corpses of copy cat zombie fiction lining the shelves. Archie Comics has shown that Archie and the Riverdale Gang's stories can actually be cool, much to my surprise, and now they've proven they can be scary too. Afterlife With Archie is one of those rare zombie fictions that is worth checking out (beyond the now uber famous The Walking Dead). Afterlife With Archie might not end up being as good as The Walking Dead is, but so far it's at least as interesting.